Nine species of Eimeria are capable of infecting chickens. Depending on the localisation of lesions in the intestines, coccidiosis are divided into caecal, induced by E. tenella, and small intestinal, induced by E. acervulina, E. brunetti, E. maxima, E. mitis, E. mivati, E. necatrix, and E. praecox. All are intracellular parasites belonging to the Eimeria genus of the Eimeridae family. The exogenous development of Eimeria in poultry consists of forming in their oocysts, 4 sporocysts with 2 sporozoites each. This process, called sporulation, happens only under suitable external conditions, adequate warmth (the optimal temperature is 29°C), moisture and oxygen. The sporulation process usually occurs within 24–48 hours after excretion. At temperatures below 8°C, most of the unsporulated oocysts perish, but in those which survive, sporulation could go on for more than 8 weeks (Obreshkov et al., 1978). 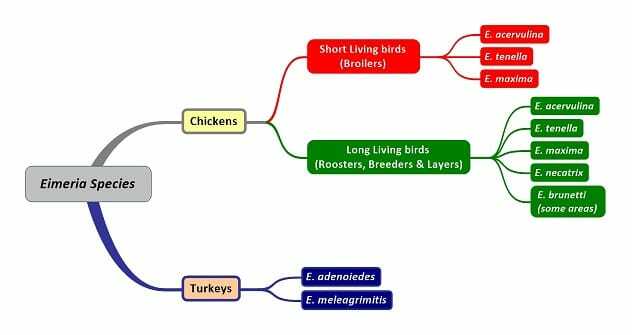 Eimeria in poultry is very host specific, with the exception of cases in which severely immunosuppressed birds were used (McDougald & Fitz-Coy, 2008).